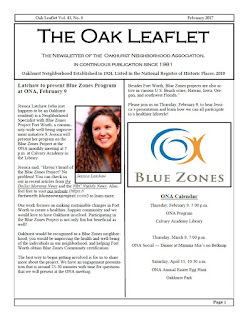 Oakhurst Neighborhood Association, Fort Worth, Texas: February Oak Leaflet Now Online! February Oak Leaflet Now Online! Check out this month's issue of The Oak Leaflet online! This month's newsletter introduces our February guest speaker, Jessica Latchaw—an Oakhurst resident and Blue Zones Neighborhood Specialist; she will be presenting an overview of the program. Also featured is an article by Libby Willis on the Alexander family, who lived in Oakhurst in the '40s and '50s and had ties to President Lyndon B. Johnson. In lieu of Yard of the Month, Fran provides an introduction to the Maxtin family, who are relatively new homeowners in Oakhurst (but have plenty of ties to the neighborhood). Fred gives us his monthly patrol report, and Kathryn shares both her president's column and a selfie from January's ONA social at Mamma Mia's. Remember that this month's meeting is coming up on Thursday, 2/9, and our next social will be returning to Mamma Mia's on 3/9! Visit our Newsletter Archive to view or download past issues.